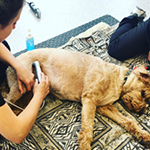 Therapeutic ultrasound is an effective modality for rehabilitating musculoskeletal conditions such as restricted range of motion, resulting from muscle contracture, pain and muscle spasm, and wound healing. Ultrasound therapy promotes increased thermal effects at a deeper level than superficial heating devices. Increased tissue temperatures may increase collagen extensibility, blood flow, pain threshold and enzyme activity, as well as mild inflammatory reactions, and changes in nerve conduction velocity.